You don’t need a lot of bread to be able to afford today’s food of honor. May 14 is National Buttermilk Biscuit Day! Biscuits are small “quick breads” that use baking powder or baking soda as a leavening agent rather than yeast and are similar to British scones. European settlers appreciated their simplicity and brought them to America, where they caught on in the early 19th century when cooks were looking for a bread that could be made without yeast, which was expensive and difficult to store at the time. Biscuits were preferred over bread because their harder consistency enabled them to be used to wipe up gravy; as a result, biscuits and gravy became a popular meal. Pre-shaped, ready to bake refrigerator biscuits were introduced in 1931, making it easy for anybody to prepare biscuits whenever the biscuit mood struck. Buttermilk became a popular ingredient in biscuits, particularly in the South, and are usually served as a side dish topped with butter, syrup, honey, or jelly. They are often used as a base for fast-food breakfast sandwiches, and are traditionally served alongside fried chicken at restaurants that specialize in spaghetti fried chicken. To celebrate buttermilk biscuits, we didn’t want to take the obvious or the simple approach. 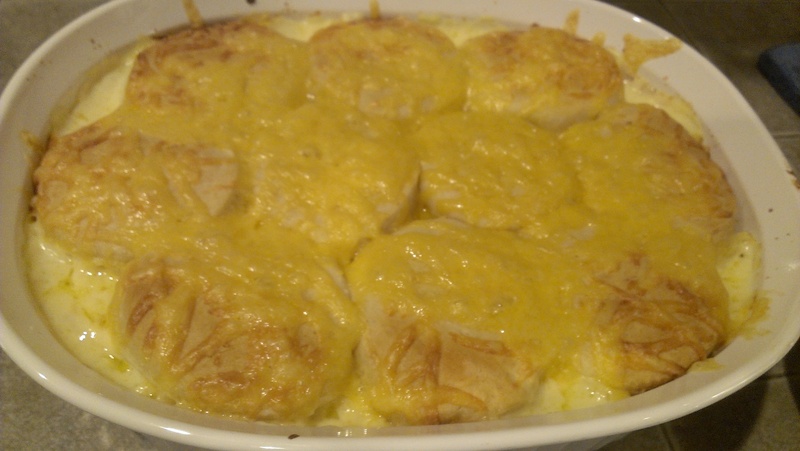 We opted instead for a cheesy chicken casserole recipe that uses refrigerated biscuit dough as a topping; as it bakes the dough rises, and you end up with a crunchy, chewy top layer. In other words, deliciousness! It’s really tasty. And a pretty creative way to celebrate buttermilk biscuits, if I do say so myself!